To install the Interceptum Android application your Android device must run Android Lollipop (version 5.0) or a more recent version (Oreo, Nougat, Marshmallow). Once the installation is finished, click on the Open button. When the application first launches, it will ask you to sign in to your Interceptum account. You then need to select with which survey you want to work with offline. You then download the survey to your device. You can then complete the survey multiple times while you are offline. Once you are done completing the surveys and have re-gained internet connectivity, you can upload the responses. Note that you need to be online to complete steps 1 - 3. Enter your account name, username, and password and click Sign In. From the menu in the top right corner, click on "Select Survey". In the dialog of available surveys, select the survey you want to complete while offline. From the main screen click on the download icon to download the survey to your device. You are now ready to complete surveys offline. 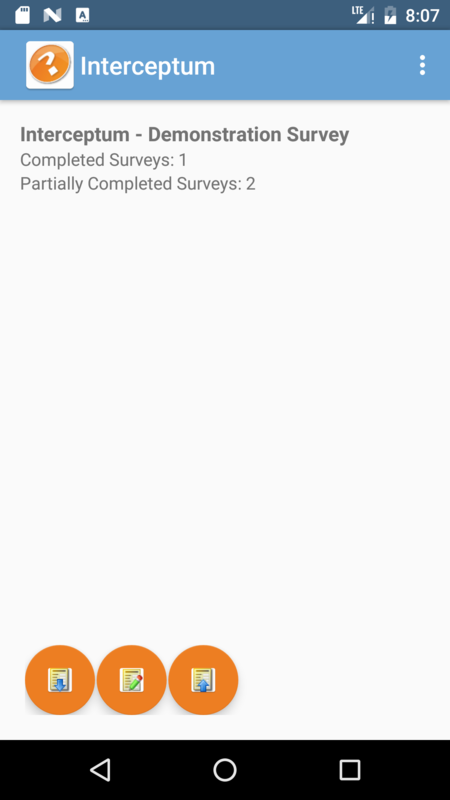 From the main screen click on the complete survey icon to start completing the survey. If your survey is multilingual, a dialog will appear to ask you to select in which language you want to complete the survey. The survey will then appear and allow you to complete it normally. When you submit the answer at the end by clicking the Submit button, you will be brought back to the main screen. You will see the Completed Surveys count increase by 1. To complete the survey again, on the main screen click on the complete survey icon . When you re-gain internet connectivity, you can then upload your responses to the Interceptum servers by clicking the Upload Responses icon .